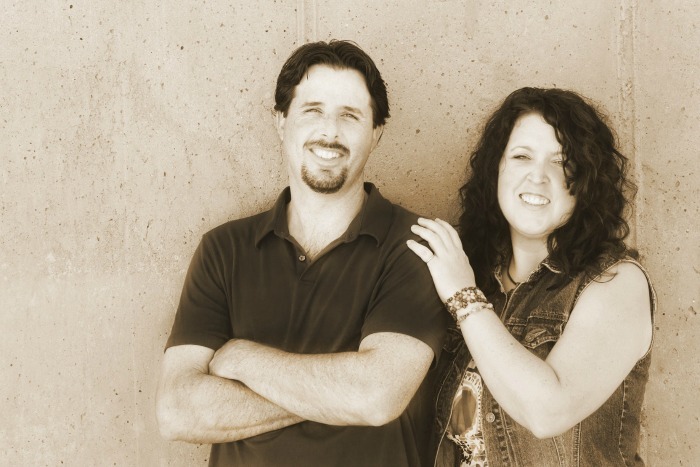 For those of you who might be new, we are participating in a 7 week – One Room Challenge. We are making over a room above our garage into a “Game Room” or a “Man Cave”. We have included some affiliate links to help you shop this room. 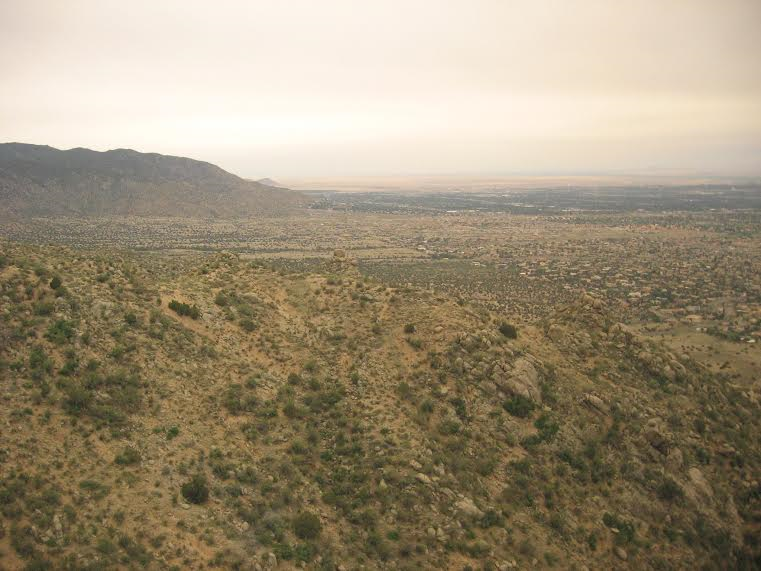 Near our home in Phoenix, Arizona (we moved to Oregon a couple of years ago), we were exploring an open “desertish” area near our son’s orthodontist. 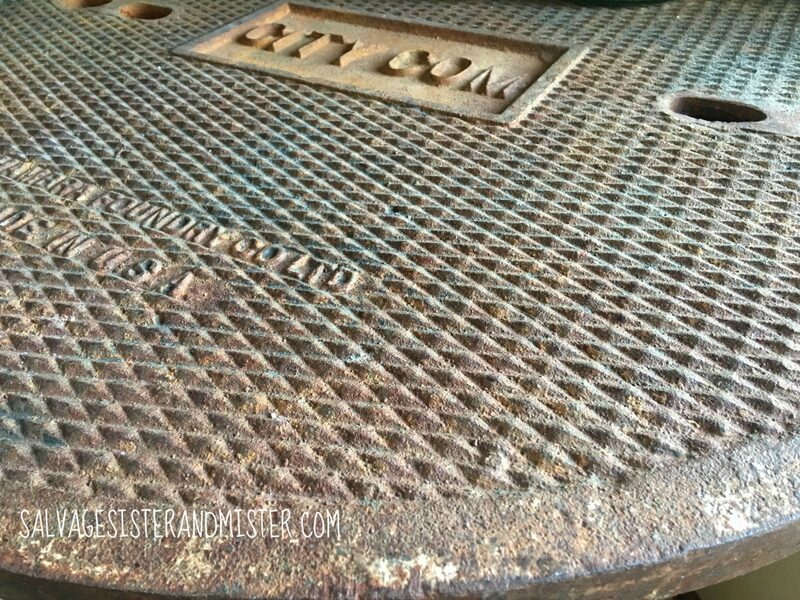 The Mister found, what else…… an abandoned manhole cover. And who can say no to an orphaned manhole cover? Personally, I would love to know how it got from California to the Arizona desert anyways??????? Well, the Mister decided the manhole would make a nice table top so bring on the brawn and heave-ho. 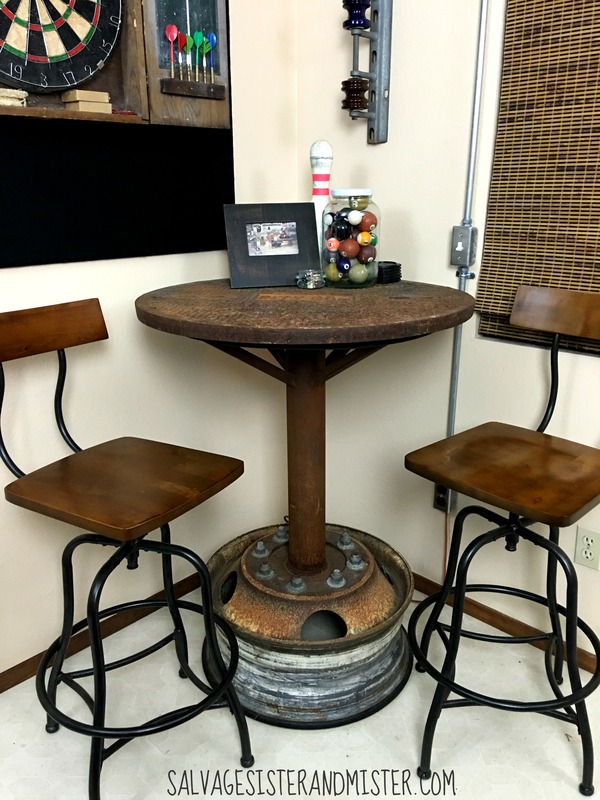 Now we would need the bottom portion of this industrial bar table in the making……. Of course, with an upcycle project, you never know what you will come across to make a project complete OR WHERE you will come across it!!! 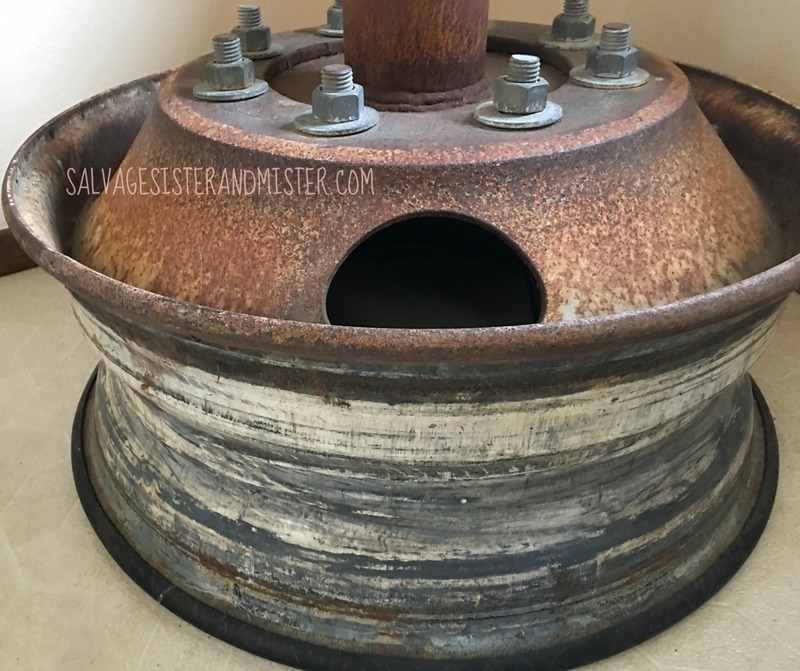 On a drive from Arizona to Southern California (a drive we use to do quite often) the Mister spied, with his little eye, a huge truck brake drum. Perfect for the base of the table. AND several miles between exits! We turned around, like any responsible junker would do. However, we didn’t know the exact spot we saw it. It seems like it would be easy to spot but not so much when you’re on a major interstate. We missed it and had to turn around again!!! Yes, we know there is a certain amount of crazy involved here. At least we got a good story out of it. After we figured out how to get this thing into our van and not end up with a filthy mess, we took it home, only for it to get stolen from our side yard!!!!!!!!!!!!! The Mister thought he remembered a truck tire on a rim around the same area. For our next trip, we had our eyes peeled for this tire. Low and behold, we found it!!!! Can you believe it? I guess it might not be that unbelievable that someone didn’t pick up a huge abandoned truck tire though. I am sure people driving by are thinking “What in the world???”. After we get it home, the Mister cut off the tire which was a LOT of fun (just ask him..there was smoke involved)…. and NOW WE HAVE OUR BASE! We, meaning The Mister, welded the post to a plate. Threaded rod was welded to the plate to go through the lug holes bolting the plate to the wheel. Tubing was welded near the top to stabilize the table. 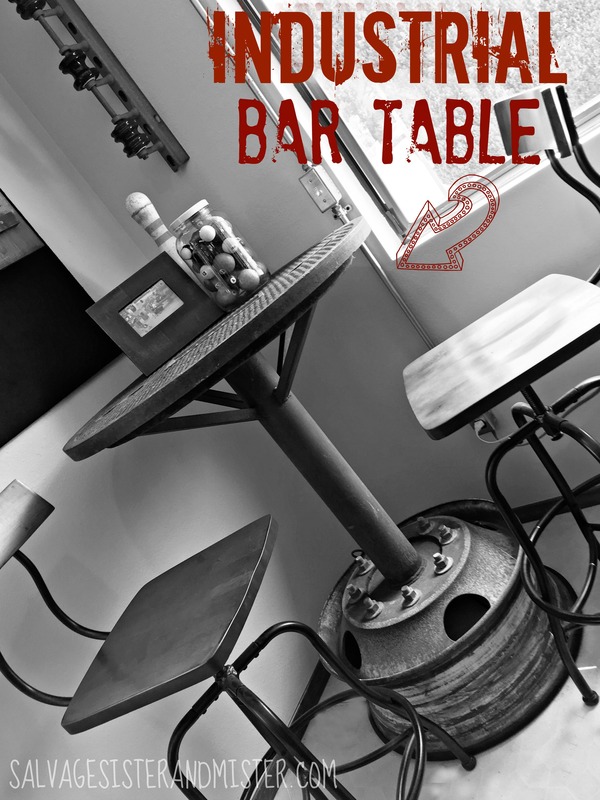 AND THIS INDUSTRIAL BAR TABLE IS A BEAST! It weighs a TON, but it certainly is a conversation piece. The Mister is in hopes of making some stools however we haven’t come across any pieces YET so we did purchase these from Target. 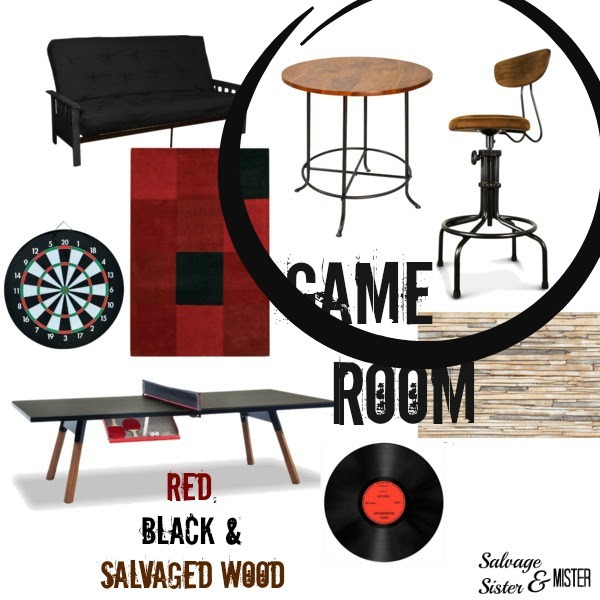 For our one room challenge, in addition to the industrial bar table area, we have added lighting and a dart board. Galvanized conduit was used for the lighting and the lights were found at our local Habitat for Humanity ReStore. The dart board was a yard sale find. The Mister mounted it to a board the we covered in felt from Jo-Ann’s. Other than the chairs, most of this was upcycled materials. Great for budget makeovers. We hope you will come back next week to see our progress on this room makeover. Stacey, Thanks so much. The room will be so much fun. Hopefully we will get it done before our two teens leave the home 🙂 And thanks for the info on the link up party!!! Wow, love the concept of all of this! Can’t wait to see that ping pong table come to life. We have a super traditional (ugly) one in our basement. We are halfway there! Can’t believe how fast time is flying. Boy this challenge is fast for sure! I got to get moving 🙂 Thanks so much for your sweet comment!!!! We actually found our beloved dog in the AZ desert. Your table is a fabulous upcycle. What an absolute delight this post is!!! Thank you so very much for joining the gathering at Thoughts of Home on Thursday. Laura, Really? Wow! Good thing you were there to rescue that pup! Thanks so much for your sweet comment! Loved this story!!! Such a cool table! Awe Thanks Jessica!!! So sweet of you!!!!!!!!!!!!! Marianne recently posted…Decadent Sweet Natural Organic and Good For You! I hear ya Emily. Our house before this one wouldn’t have had the space either. This house needs a ton of work but it’s fun to have the room over the garage for this. Nicole, Thankfully we were able to find another part. Thanks Michelle, It is a beast! It weighs a ton!! This table yells man cave. I like that its bar stool height suits the industrial theme. Very unique and cool. Yeah, the game room is pretty much a man cave. It’s def a fun piece. Thanks for stopping by! Oh, no doubt this thing is a beast! Just one question…how do you write on a table like that?? I see those little ridged groove things, so I guess the answer is you don’t write, right?? Ha! Well, anyway, I can’t believe all your mishaps trying to get your uh “hardware” home, but love the man cave! 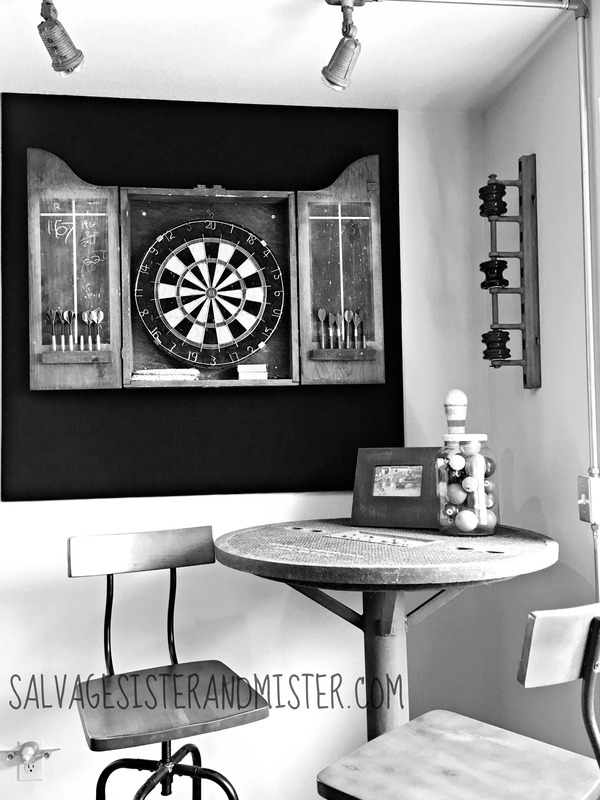 Love the dartboard! Great yardsale score! I’ve always wanted to throw darts at a dartboard, but not $89 worth. LOL. Hope he loves his man cave!